The Foremost Auguste Collection is traditional and timeless. 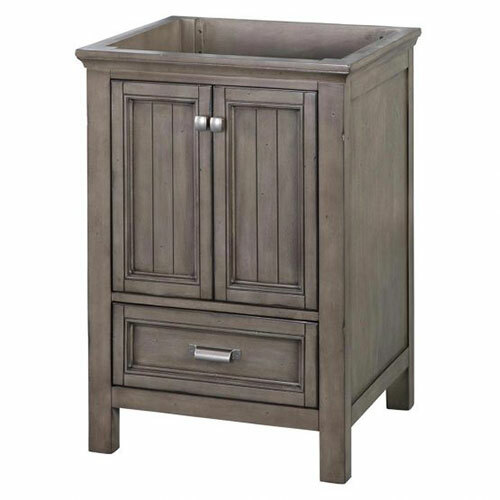 With distressed pewter knobs and beautiful finishes in white, chestnut, black and grey, these vanities match any décor. The slow close door hinges bring a modern touch to an already classic item. The vanity top is not included, so you can customize your vanity to your individual style! Choose your vanity top from our wide in stock selection at Builder Supply Outlet and if you don’t find anything you like, order a custom top! Don’t forget your sink and faucet to complete your bathroom project. Update your bathroom with the Auguste collection found at Builder Supply Outlet. 24" x 21.5" x 34"